Even though we’ve seen high gas prices come down a little it still hits hard on most of our budgets. If the price you pay for fuel is consuming a bigger portion of your budget, you may be tempted to put off other needs of your automobile – like scheduled maintenance at Professional Automotive. News reports and industry studies have indicated that you’re not alone. Some 9 out of 10 cars on the road have at least one maintenance or repair item that hasn’t been done. Some of these items can be considered serious safety concerns. While most of them will simply affect the cost of operating your vehicle. Some of the best examples of people who know how important maintenance is are people like professional vehicle owners. Fleet companies like trucking and delivery services. Their livelihood depends on how well they take care of their vehicles. They have gotten scheduled maintenance down to a science. And the last thing you will see them do is skimp on regular vehicle preventive maintenance. Why is that? Remember the old saying, “A stitch in time saves nine?”Routine maintenance prevents expensive repairs and costly breakdowns. Plus a well-maintained vehicle uses less fuel. When you own or operate a large fleet even a small percentage of less than optimal performance can keep them from being profitable. Professional Automotive offers services that could potentially save you on fuel costs. Things like Fuel system cleaning, transmission service, differential service, wheel alignment, oil change, and tune-ups. Ring any bells? Is there at least one thing that has been recommended to you but you have been putting it off? For example, let’s say you chose to spend $150 and get caught up on some of these services and they improve your fuel economy by 15%. What would that mean to you in savings just in fuel? The average personal vehicle is driven about 12 to 15,000 miles a year. If you get, lets say 20 miles per gallon, over the course of 12 months you would pay for the $150 worth of maintenance and save an additional $165 if gas is at $3.50. The more expensive gas is the more important it is to keep your car fuel efficient. This example just figures the savings you will have in fuel expense. There are also savings from premature wear or breakdowns. So catch up on those services you’ve been neglecting. Talk with your friendly Professional Automotive service adviser about your vehicles needs. Get a couple done now and a couple next time. Chances are you’ll save a lot of money on fuel this year – and a lot more on repairs in years to come. Give Brandon or Curtis a call at Professional Automotive today. Professional Automotive 317.596.0898 7013 E 86th St Indianapolis, IN 46250 At Professional Automotive in Indianapolis IN (46250) we install quality NAPA replacement parts. Give us a call at 317.596.0898 . To learn more about NAPA AutoCare, visit www.NAPAAutoCare.com. Professional Automotive Tech Question: I’m Jon in Indianapolis, IN. For some time now. I’ve been having some battery problems. I had trouble starting my car so naturally I bought a new battery. After I first installed the battery everything was fine. Then a short time later I started having the same problem. So I thought I must have gotten a bad battery. I went back to the same parts store, they were happy to exchange it for me. Again, everything was fine for a while then I had trouble starting my car again. So here I go back to the parts store. When I walked in with my battery, the guy behind the counter recognized me and asked why I needed yet another battery? He asked if he could test it for me. So he tested my battery and it was OK. Apparently I’ve been replacing good batteries. What’s wrong with my SUV? Professional Automotive Answer: Jon, I applaud your efforts to save yourself some money and try to do this yourself. 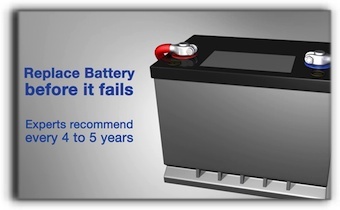 Unfortunately you based your decision to replace your battery on too little information. First, Jon was right to suspect battery failure. He probably should’ve asked to have his battery tested the first time he went to the parts store. This would have helped him to know that it was something else. There could be a number of reasons why Jon’s car wouldn’t start. Unfortunately, he spent how many hours of unnecessary expense and inconvenience and still has an SUV that isn’t dependable? We see this type of situation a lot. People want to save money so they try and do things themselves. Then after they have spent too much time and money on wrong repairs they finally listen to their wife and come in looking for help. We would much rather you come in and speak with us first. We will save you that time and money. If you find yourself in a situation like Jon, do yourself a favor and talk to a professional at Professional Automotive. If you live in the Indianapolis, Castleton or Fishers area, give us a call. We will do what is best and take great care of you. Give us a call. Professional Automotive 7013 E 86th St Indianapolis, IN 46250 317.596.0898 http://professionalautomotiveinc.com At Professional Automotive in Indianapolis IN (46250) we install quality NAPA replacement parts. Give us a call at 317.596.0898. To learn more about NAPA AutoCare, visit www.NAPAAutoCare.com. When we drive in the Indianapolis, Castleton or Fishers area, we will encounter various blind spots. We can generally reduce those blind spots by making sure we adjust our side and rear view mirrors to give the best visual coverage possible. Make the adjustments to your car before you even start the engine. First, be sure to adjust your rear view mirror giving the best possible view directly to the rear of your vehicle. Some of you may use it to get a better view of the sides of the car, your wonderfully behaved kids in the back seat or your bright smile, but let use it for its intended purpose. The rear view mirror should look to the rear of you vehicle. Secondly, Keep in mind that your vehicles mirrors are used to to help eliminate visual blind spots. So as your adjusting the the passenger and driver side mirrors you will want them to be aimed at objects to your sides. When adjusting them, set them so that you barely see the side of your car. The up and down setting is also important. You will want to make sure that they are not pointing too high or too low. You should error on the side of being set lower than high. As long as you can see the top of the average car behind you that should be plenty. If set too high it will create a blind spot towards the rear bottom side of the lane next to you. With your vehicles mirrors adjusted properly in this way, you’ll have maximum coverage. Of course driving in the Indianapolis, Castleton, or Fishers area is a highly fluid process – as you know things can change very fast. So be smart and take a quick look to the side when passing to make sure that another car hasn’t suddenly appeared into an area you couldn’t see in your mirrors. As you drive in the Indianapolis, Castleton, or Fishers area, try to avoid being in other diver’s blind spots. You can’t always count on other drivers to be watching their mirrors and looking out for you. Always give larger vehicles the right of way. Be sure to pass them on the left whenever possible. A larger vehicles blind spot is on the right. Pay attention and always be sure to wear your seat belts, and thank you for reading! At Professional Automotive in Indianapolis IN (46250) we install quality NAPA replacement parts. Give us a call at 317.596.0898. To learn more about NAPA AutoCare, visit www.NAPAAutoCare.com. Today’s Indianapolis ProTalk article focuses on your suspension system. After many years of driving on our streets in the Indianapolis, Castleton, or Fishers area, your car’s suspension system components will eventually wear out. As you can imagine, if most of your driving is on smooth roads, your suspension parts will last longer than if you do most of your driving on bumpy roads or hauling heavy loads. In addition to just wearing out, Professional Automotive customers need to know that suspension components can be damaged in an accident or by a hard impact – like one of our many potholes, sliding into a curb, or repeated bumps in the road. Because the life span of suspension parts can vary so widely, your cars manufacturer and Professional Automotive recommend frequent inspections to make sure all components are safe. During our inspection, which we perform on every visit, we will check for worn, broken or missing parts. Signs that suspension parts like shocks or struts are wearing out: The tires may show signs of a cupped wear pattern. This can be formed from the shocks bouncing unevenly as you drive around the Indianapolis, Castleton, or Fishers area. If the front of your car dives excessively when stopping, or rocks back and forth after you stopped, your shocks may be worn out. And if they are leaking fluid, it’s definitely time to get them replaced. You may also notice squeaking or knocking noises. This can be related to the ball joints or tie rod ends. If you are experiencing any of these symptoms, come into Professional Automotive for a suspension inspection. The same goes if you’ve been in an accident that involved one of your wheels. Letting your worn or broken shocks go with out service can cause premature wear or failure on other steering and suspension components such as ball joints and tie rods as well. If your suspension calls it quits while your driving, it could lead to a serious accident, so let us take care of your steering and suspension components at Professional Automotive. When you replace your shocks or struts, it might be a good idea to just go ahead and replace all four at the same time. That will give you even better handling. Talk with your service adviser at Professional Automotive if you think you suspect you might have a loose steering or suspension component. Most inspections are free with an oil change so get your scheduled today. It will save you money in the long run. Unattended to problems only cost more if we let them go. As always we will provide you with honest advise that will help you make the best decision about your repairs and maintenance. At Professional Automotive serving in the Indianapolis, Castleton, and Fishers area. (46250) we install quality NAPA replacement parts. Give us a call at 317.596.0898. To learn more about NAPA AutoCare, visit www.NAPAAutoCare.com. Success is never accomplished by yourself. That is why we have partnered with some very respectable companies. Copyright © Professional Automotive, Inc.